Maybe designing flags is not really that especially different from the elements of making Art that an Art student is introduced to as basic to almost everything to be learned as beginning “rules” in any Art curriculum. Courses titled: Composition; Elements of Art; Design I; Color I, etc.,–beginners’ work. Vexillology; from the Latin word “vexillum;” which was the name for a “flag” of ancient Roman cavalry–actually these were more like “standards;” more like plaques, tablets or posters–or small flags similar to what the military call GUIDONS. 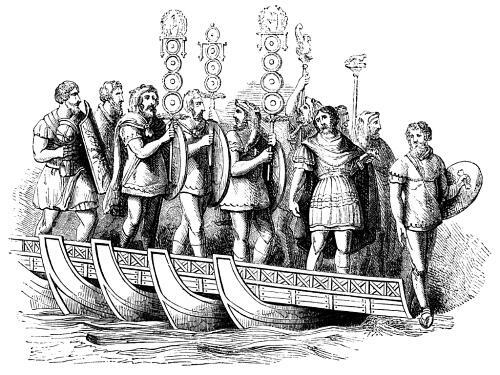 Even earlier than Roman use of such markers, among Egyptian carved reliefs there are seen, plaque-like shapes with insignia atop staffs being carried in processions. My own interest in the study of flags came late–after teaching Art for thirty years in a Minnesota State University. It is known that “ART” as a vocation, is really a life-long dedication–the connection of it to one’s life never ends when the Academic studio door is shut upon leaving the premises. I’d have to classify my turn to flags at the first stage as a “vexillophile”–a hobbyist; that is, collecting colorful designs, interesting stories of a flag’s origin, its meaning to the people whom it represented as well as the pride in which the flag was held by patriots of a state. Still an amateur, but rising to the level of “vexillographer”, a designer; revived my prolonged immersion in the world of Art; most all of the rudimentary aspects of Art emerged. This is the serious hobby that has begun. The shapes, the colors, the symbolism of them, the response to a demanding need to make an old, tired design “better” in all the ways one is able. Finally, it has come to this. How to look at a flag; understand a flag’s purpose, find among its advocates–those it represents, the core/essence to unite as many as possible persons to honor their flag with pride in displaying it, find emotional connection to it when it is spied flying in any setting, among many other flags. How then can we demonstrate the creation of a flag in any other fashion than by objectively following “guidelines” to help find it. To do this, we are indebted to Mr. Ted Kaye, long-time NAVA enthusiast who has compiled the pamphlet, GOOD FLAG, BAD FLAG; How to Design a Great Flag. The value of this book is that one should recognize that its contents are meant like “corrective surgery” applied to many flags already in existence. Kaye means to help detect the BAD flags, but then engage every element one can to re-design or make a totally new flag that is a better one. 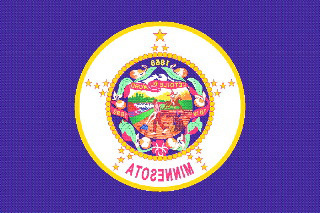 At hand, we shall show the obvious example of a BAD flag, in need of “repair” and re-design; our Minnesota State flag dated from 1893, with minor modifications over the years–a “political” one as late as 1983. I like Ted Kaye’s positive approach; that is, he explains how the GOOD flag is a good one before following with the comparison to the BAD flag. We should see the virtues of design in the one, rather than, first calling it BAD to then tear it down. See what I mean? Rule” #2.) Next, Kaye suggests, “Use Meaningful Symbols” having to do with the flag’s images, colors and patterns as they relate to what the flag symbolizes. Our design proposal, in a positive way, “centers” on the original flag’s motto, “L’Etoile du Nord” as it is now shown physically as a large white star shape at the top position on a dark blue vertically placed bar. To go on; the colors and shapes clearly mean to symbolize sky, at night and in daytime, the shapes of snow-covered slopes and then green when in summer. It cannot get much more plain and simple than that to evoke the NATURE of Minnesota. On the other hand, with the old flag, if one can make out the complicated graphic details of the current flag, one will find the symbolism to be an unfortunate reference to Manifest Destiny–a sore point among Native Americans, even to this day. “Rule” #3.) Says, “Use 2–3 Basic Colors.” Limit to three which will contrast well and come from a standard color set…We say our flag has only three colors because we judge white to be a “non-color,” really. A flag manufacturer or a printer, on the other hand, charges the white as one of the four colors. Still, this difference does not detract nor complicate in any way from the simplicity of the manner in which the colors are juxtaposed. That is to say, Our color-selection works well in Gray Scale (Black to White). The colors, too, are chosen from a “standard color set”–industry’s-widely used Pantone Scale. 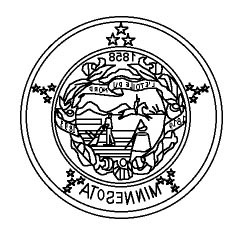 By contrast, the colors of the State seal used on the flag are many–six or more–in skies, streams, trees, horse, clothing, plowed earth and so on. 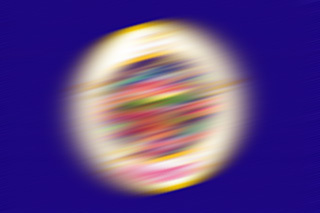 The older flag with the State Seal, when viewed atop a flag pole, loses all separations of one color from another: it becomes a blur. “Rule” #4.) NOTE: No Lettering or Seals. Never use writing of any kind on flags… This rule is like the barrel with fish in it–easy. The easiest one of which to convince anyone looking at the flag. Our design has absolutely no need for commemorating any dates in time, nor slogans, nor writing Minnesota’s name on it. When a flag designer is asked to add the letters of the state’s name particularly, his client is conceding that few will recognize his flag without them–that the design is trite and repetitive. The 1893 flag violates this plain and simple “rule” all over its face. There are printed three different dates: 1819, 1858, and 1893. On a curving knotted “scarf” is inscribed, “L’Etoile du Nord” in gold. And, to complete the violation–the name of MINNESOTA is printed in large, block letters in RED. The proof of the awkwardness of the arrangement is the fact that, when the flag is viewed on the reverse side—-all letters and numbers are mirrored; they are BACKWARD and unreadable. Not so with our proposal. “Rule” #5.) Be distinctive or be related;—Avoid duplicating other Flags, but Use similarities to show Connections… Now, our design-change proposal could be said to subtly reveal acknowledgments or nods of slight acquaintance to other influences. Great Art has referenced other art; the artist is showing off his wide awareness of what is going on in his world. Our choice of colors, like other designers of flag changes, are those seen and used everywhere around the state of Minnesota–the blue colors and the green. 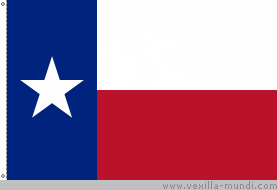 One might say that our design is a “cousin” of the Lone Star flag of Texas. Other’s designs show relation to the old flag’s’ use of yellow/gold among the stars. We chose not; the North star is clear, bright and white–this is Nature. Another thing–perhaps a too, too subtle thing is that we intended to make a historical connection to the designs on many of the other old flags that, in their centers; have small bucolic “scenes” showing the bounties of Nature. WE meant to evoke some of the same as our design has a slight downward bend in the stripe in the center–like sloping hillsides on which Minnesota’s two major seasons show their colors. Our flag is not like any other flag, anywhere. It is unique. We are sure a great many Minnesotans would like it to stand for them and our beautiful State. ~ by marcstratton on 18 October 2008.